Villiers High School, Southall; Greenford Sixth Form College; City University London. I don't indulge in such activities! 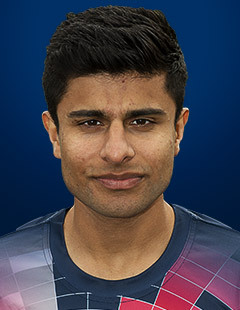 Left-arm spinner Imran Qayyum signed for Kent in 2014 after impressing as a triallist in the second XI the previous season. The former Middlesex age-group player impressed former Kent and England spinner Min Patel and made his senior debut in 2016. He made his bow at Northampton against another former Test left-armer Monty Panesar and took three wickets before claiming another three later that season against Sussex at Tunbridge Wells. 2017 was a breakthrough year for the spinner with Qayyum being regularly preferred to England spinner James Tredwell in the NatWest T20 Blast. He took seven wickets at an economy rate of 8.3 and later made three appearances in the Specsavers County Championship.